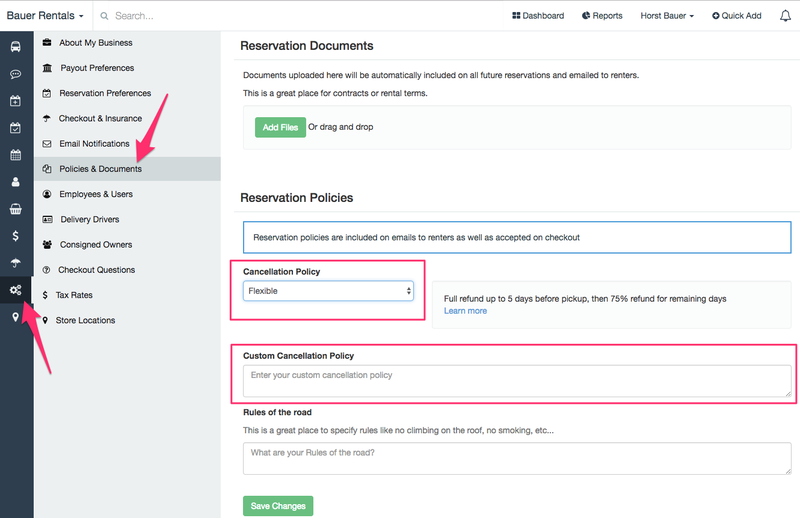 How do I set a Cancellation Policy? Cancellation Policy Settings can be found under Account Settings and Vehicle Settings. Cancellation policies can be set at an account level or set within each vehicle. Vehicle settings override the Account settings. Refunds are not automatically processed when a cancellation occurrs. Wheelbase Support may process overdue refunds for Outdoorsy customers. Find your Account Settings in the Main Menu on the left side of the screen. Flexible - Full refund up to 5 days before pickup, then 75% refund for remaining days. Flexible, Moderate, Strict, Custom, or use account settings. If you have any questions, reach out to us using the live chat bubble in the bottom right hand corner.